The Growth of Smoothie in Canada | DSL Inc. The smoothie industry is expanding beyond its roots as an alcohol and specialty retailer offering to become more of a staple within a wider segment of the foodservice industry. A high margin smoothie program can be an innovative way to expand your market, offer healthy menu extensions or create some excitment around a new product line. As with most cold products, we are moving into the prime selling season, which makes it a great time to look at your beverage menu. Below you’ll find an article written by Technomic on the resurgence of the non-alcoholic smoothie and beverage market in Canada. If you require more information on options for your frozen beverage or smoothie program, please contact us, we have solutions that have helped many, including independent restaurants and convenience stores, and large chains successfully launch their frozen beverage programs and reap the rewards. Earlier this spring, we examined how Canadian casual- and family-dining restaurant chains are adding interest to their adult beverage menus—most notably by introducing craft and premium beers and inventive new cocktails. But beverage innovation isn’t limited to alcohol offerings. Looking to offer flavourful alternatives to standard sodas and juices, more Canadian restaurant operators are menuing creative new non-alcohol beverage selections, too. Operators are using exotic teas and tea-based beverages to appeal to health-seekers and positioning juice-and-soda blends as a sweetly refreshing treat for diners of all ages. Restaurants are giving more thought to mocktails, as well, offering toast-worthy options for guests who can’t or don’t want to consume alcohol. For the coffee-averse and the health-conscious, Country Style recently introduced tea lattes in chai, London Fog, green-tea and matcha green-tea varieties, as well as frozen tea frappes. Blenz Coffee offers both Mumbai Classical Chai (without milk) and an organic, caffeine-free Rooibus Chai Latte. The specialty-tea market is poised for further growth, too: Among consumers who have consumed a specialty tea, 40 percent say they’re likely to increase their orders of these types of drinks in the next two years, according to Technomic’s 2012 Canadian Beverage Consumer Trend Report. Interestingly, although 54 percent of Canadian consumers said they had consumed hot tea in the past month, only 23 percent said they had purchased hot tea from a restaurant or other foodservice venue—revealing room for operators to capture a major market. In juices and sodas, a rush of product introductions in the past year included IHOP’s Splashers, which blend lemon-lime soda with juice, berries and/or fruit syrup. Denny’s added Blackberry Orange Twist and Desert Blush flavors—also combining lemon-lime soda with fruit flavors—to its line of Fusion Favorites. And T.G.I. Friday’s introduced Strawberry Lemonade Crush and Cherry Limeade Crush on its Simply Refreshing non-alcohol beverage menu. Smoothies are still proving to be a popular vehicle for menu development, too. Burger King introduced Strawberry Banana Smoothies, made with yogurt and chunks of real fruit, in December. In March, it followed up with the debut of limited-time-offer Tropical Mango Smoothies. 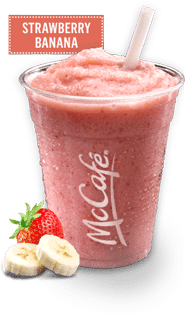 And McDonald’s Canada expanded its Real Fruit Smoothies lineup in April with the addition of a strawberry mango orange variety, also an LTO. As 2013 plays out, look for more new sodas and soda-based drinks to take center stage. In March, the Canadian Restaurant & Foodservice Association named house-made soft drinks as one of its “up and comer” menu items for 2013, based on a survey of more than 350 professional chefs. Casual-dining chain White Spot, with locations in British Columbia and Alberta, is in on the trend: It recently introduced a strawberry mint soda made with strawberry puree, fresh mint and soda. Finally, creative mocktails are moving into the mainstream—meaning that guests seeking fun alcohol-free choices no longer just have to order “virgin” versions of standard adult drinks. At Blue Water Café + Raw Bar in Vancouver, the Misirilou pairs coconut water, orange-flower water, lime juice, honey syrup and cucumber, and the Pablo Honey features white peach puree, fresh lemon juice and honey syrup. The Beach House Restaurant and Lounge, also in Vancouver, offers the Southern Hospitality: fresh grapefruit juice, house-made ginger syrup and iced tea over ice. Today’s more-adventurous consumers—especially younger guests—are willing to shake up their beverage routines, if they’re given appealing-enough reasons to do so. For operators, menuing innovative non-alcohol beverages that showcase layers of flavor and offer relaxing or reinvigorating refreshment could be the ticket to boosting beverage sales.